x . x x . x x . x x . x x . x x . x x . x x . x x . x x . x x . x x . x x . This must be one of the most easiest of cake recipes! It doesn’t involve separating eggs. Nor whisking any time-delicate meringues, so you can take as much time leisurely making it. There’s minimal washing-up to do too, as all the mixing happens in one bowl. As for the biscuit base, you can further avoid washing-up by simply massaging the store-bought biscuits & butter in a food bag! Of course you can do it the usual way by using bare hands, but do it my way, you’d also avoid getting unpleasant biscuit-mash in your nails & your fingers buttery.^^ On that same note, I also suggest cling-filming the 3 middle fingers when pressing down the biscuit to the base. The texture of the cheesecake is creeeeeamy! I managed this by tweaking the balance of the ingredients so that it uses tons of double cream/ sour cream/ cream cheese, but as little as possible of flour (… flour creates the ‘structural pillar’ that holds the cake in the inflated spongier shape – please read my blog-entry on flour for explanation of this). – Like the lady who said: “I used to buy your flour-less chocolate cake all the time, but now I converted to always buying the cheesecake!” And the spectacled-man who’d get disappointed if it’s sold-out. There’s also my favorite tomato-seller girl who’ve been buying the whole cake for 4 weeks in a row, but says she never gets to eat as much as she’d like to because her boyfriend & her family loves it too! 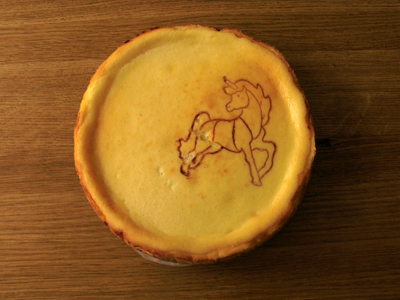 When I first started selling the cheesecake, it had no pattern on top. Although I was perfectly confident with the taste, I felt the presentation needed ‘Something’. Y’know, that ‘Something special’ for the wow factor & for the customer to justify their purchase. For a long while I was thinking of a solution to this; & I was enquiring around to see if I could get an iron stamp that I could heat & emboss/ burn a pattern with. But, one, it is difficult to get hold of, & secondly it’s never in a pretty pattern! – Then it occurred to me while I was embossing my chocolate bird tart. Ah! Just invert it! 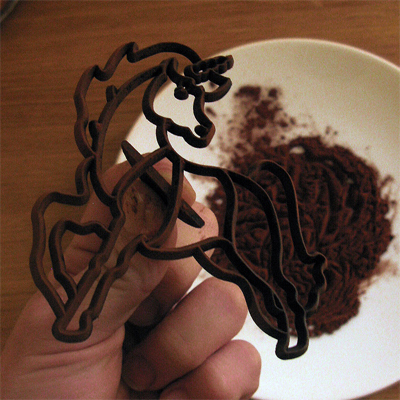 Cocoa powder & cookie cutter! 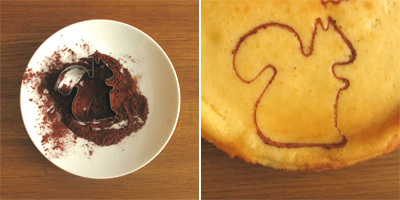 Simply dab cocoa powder on the blunt end of the cookie cutter, then tap off the excess & stamp the cake! I mixed together oat biscuits to the plain digestives to add interest in flavour. It also gives you a different sort of crunch compared to the pap the digestives can become. Resting the pressed biscuit base in the refrigerator while you make the filling firms the butter within. Sour cream tenderizes the cake, as well as enhancing the tang of the cream cheese. Excessively tapping away the air bubbles is the key to avoiding cracks on the surface that is the oh-so-common pitfall of baking a cheesecake. The only down-side about this cake (if there is one) is that you have to keep your mitts off & leave it to mature over-night! So here it is! (Finally!) 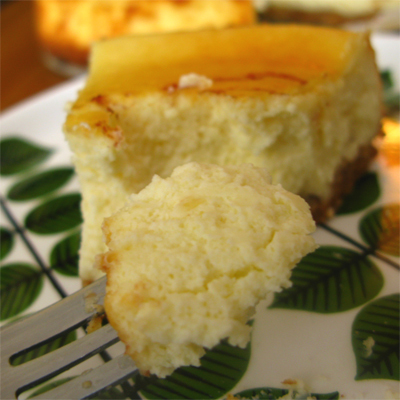 My baked cheesecake recipe. 1. First begin by greasing a 8″ round spring-form cake pan with butter. Then line both the base & the sides with greaseproof baking paper. 2. Now on to making the biscuit base. First measure your biscuits (70 grams Oat biscuits + 85 grams Digestive) in a food bag. 3. Crush them by hand or bash it with wooden rolling pin. Leave some chunky for interesting texture. 4. Melt 70 grams of butter. Put it in the food bag. 5. Massage the food bag to combine. 6. Empty the mixture in a greased & lined pan. 8. Refrigerate the pressed biscuit base while you make the filling. 9. Preheat the oven to 170 degrees centigrade. 10. Next, in a mixing bowl whisk the 70 grams of butter until very soft & creamy. 11. Add in the 90 grams of sugar. Whisk & combine. 12. Add 330 grams of cream cheese. Whisk & combine. 13. Add 90ml of sour cream. Whisk & combine. 14. Add 100 grams of whole eggs. Whisk & combine. 15. Add 100ml double cream. Whisk & combine. 16. Add 25 grams of flour. Whisk & combine. 17. Add 12ml Lemon juice. Whisk & combine. 19. Slowly pour the mix in to the cake pan. Tap it some more on the work surface. 21. Bake for 30 minutes first. 22. Have a look. If it looks like it is starting to brown too much on top, cover loosely with foil. 23. Bake for another 10 minutes. 24. Skewer test. I like it when it isn’t thoroughly cooked. (But obviously not raw!) If there’s a tiny bit of curdle on the skewer still, it’s fine, take it out. 25. Leave aside – still in the cake tin – overnight to mature. 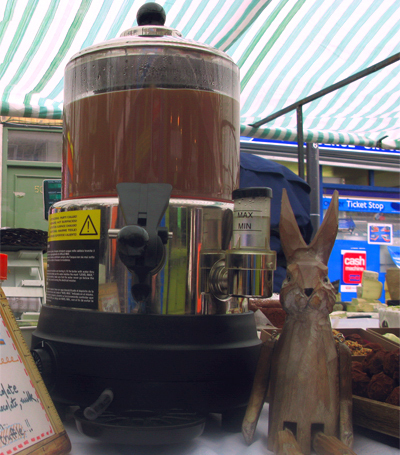 Last Saturday I finally started to sell my hot chocolate again now that the weather is proper cold! The basic recipe is 1 part cream, 1 part chocolate, 4 parts milk. – I pour it in a simple white paper cup & then sprinkle dark chocolate shavings on top for the lux effect! 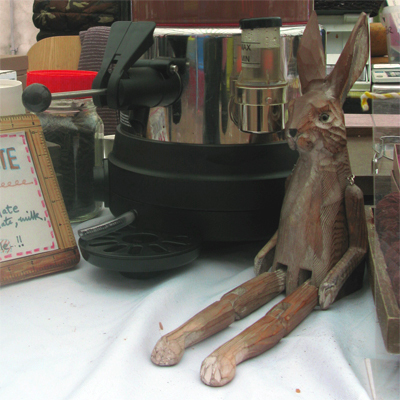 Right now it’s 1:30am on Friday night, & I ought to be in bed, ready for tomorrow’s market! (The weather forecast says it’s 90% rain… oh joy…) I’ll add more to this write-up next week when I get a chance! Good night!! But sadly, some get withdrawn (‘getcha crumbs & get out of ‘ere!’). Mainly because they didn’t sell well enough & I preferred to transfer the time making them to making the more popular ones instead. Indeed, there are also other reasons for pulling those products. For instance, cherry clafoutis (de-stoning mass amounts of cherries was cumbersome & it stained my fingers), opera (too time consuming to make all the layers & the costs became too expensive that I had to charge more), & the ‘wine poached pear rose & chocolate ganache tart’ – which got the people oohing as they see it, but only occasionally netted me the crucial sale…! 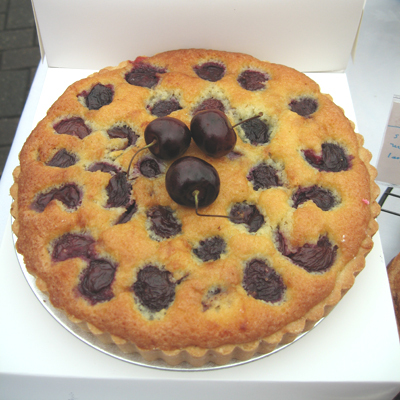 They would say: ‘The tart looks too good to eat’ (they really do say this for real, not kidding!) 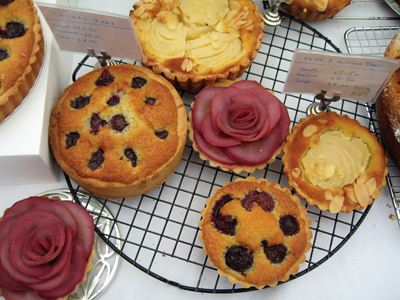 & opt for safer options like ‘pear & almond tart’ instead. 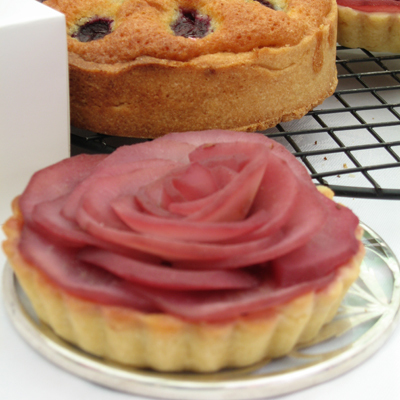 I still love this rose tart to bits though. The pear fruit goes really well with rich chocolate cream. I guess if I know that it can be sold in bucket loads, I would’ve stuck to it. The tell-tell sign for me to be convinced that they remain in my line-up is obviously its sales numbers, but, also importantly, it is when & if there are specific customers that come back for more of that same product, week after week with great reviews. The ‘Summer Fruit sponge’ (sponge colourfully studded with lots of raspberries, blueberries & blackberries) & the ‘Caramelized Banana Cake’ (whole pieces of bananas were caramelized before incorporated in to the batter) that I had sold for over a year was not the case, it was delicious, & it sold well, but never had the crowd wowing, & eventually I also lost the love for it. Whereas this ‘Baked Cheese Cake’ I raved about sometime ago in an earlier post is. Totally is. I really have to let you know the recipe asap & spread this deliciousness! So stay tuned!! I’m the type that take cook books to read in bed. I have piles of them by the bedside. I read through these books like a bible. And when I find recipes that are worth careful reading, I imagine every step in my mind… – I imagine what it must taste like. – And when it’s a “really” good recipe, I close my eyes & start to add or change the recipe here & there, think of how to serve them, & to whom, at what kind of occasion. Imagining about food, (especially with sugary content ^^) is my all-time stress-buster. Must admit, it HAS been known to have the dis-advantage of me hoping out of bed to raid my food cupboard at times (! ), but the best thing about this imagination-game is when, sometimes, my trail of thought affects the contents of the dream I am to have that night. The other night I read a recipe book in bed as usual. And I got very much fixated on carrot cakes. I like ’em moist. The cream cheese frosting, a must. No raisins, but lots of walnuts. Easy on the spices. By now, I was hoping to dream more about it in my dream, but my dream story must have had a twist, – because when I woke up the next morning, as odd as it may sound, my fixation was not CARROT cake anymore but LEMON cake instead. When I woke up, I was like: – So that’s it. Here I am totally fixated on lemon cakes. Gotta bake it. Like, now. – But what kind of lemon cake? Should it have lemon juice &/or just zest? Which cake tin? Round? Square? How should it be garnished? Lemon Icing? Drizzled? What’s the best lemon/ sugar ratio for lemon syrup? … Hmm! It’s like trying to solve a good puzzle! I Love it. So here it is, my lemon cake recipe after numerous test-bakes & sacrificial loosened belts for the cause. It is super moist thanks to the drizzle, & the sponge is flavoursome because some of the plain flour has been replaced with almond powder. It also keeps exceedingly well. Please take note, there’s lemony notes everywhere, what with the zest & the juice in the cake batter, the lemony-sugar syrup drizzle, aswell as more juice in the crunchy icing top. There’s the optional candied lemon strips for the garnish too. – IT’S pretty LEMON-MAD (but not in a OTT way). What does sour cream do to the cake? As well as contributing a fresh & tangy flavour that’s just a perfect addition for a lemon cake, sour cream, being an acidic ingredient, tenderizes the gluten formed in the cake batter, which in effect, results in a finer, dense & moist sponge. Why clarify the butter in the cake recipe? When you gently melt the butter, the 15% water content evaporates & you are left with three layers, separated by density. The top layer is fine foam of whey proteins that floated up, the middle is clear highly purified liquid, & the bottom is cloudy white residue of more milk solids. It has a higher smoke point. It can be heated to 200 centigrade before burning (for example this is perfect for pan-frying, & for making pale coloured crepes!). This is because we’ve removed the milk solids which burns easily. 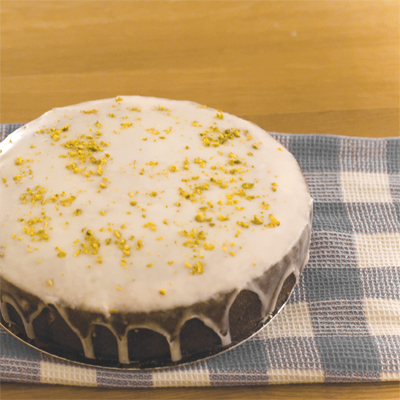 The highly purified butter gives the cake a concentrated butter flavour. Also slightly nutty fragrance. Typically financiers, madeleines & genoise sponge uses clarified butter. It won’t get rancid as quickly as un-clarified butter, since the water content & the impurities had been removed. The cake becomes moist & tender because the butter relaxes the gluten in the flour. 1. Melt butter in a saucepan or microwave. 2. Skim the foam/ froth (whey proteins) that surface with a spoon. The best way to skim efficiently is to use the back of a spoon to gently push the froth to one side of pan & then spoon it out. 3. Leave aside a little to let it settle in the pan. 4. Finally gently spoon out the clarified layer, leaving the milky residue still in the pan. The star tip here is to have it warmer than body temperature when time comes to use it. The warm liquid will be runnier to mix better with the batter (just like how oil is gloopier when cold, but watery when heated up). Melting & separating the layers is a little extra work to do, but it will make a difference! Another mundane but important tip is that you really will be better off if you weigh out all the ingredients beforehand. Line the bottom of the baking tin with baking paper. Butter the baking tin sides. Then move around some flour in it so that it clings to the sides. Tap out excess flour, & store the prepared tin in the refrigerator until needed. Grate 1 large unwaxed lemon & mix it with a teaspoon of sugar & leave aside ( = the sugar enhances the lemony quality/ essence). Remember, don’t grate the white pith under the yellow skin. It’s too bitter. Melt 130g of unsalted butter. Weigh out 100g of the clarified liquid. 1. In a large steel mixing bowl, loosely whisk 200g of eggs. 2. Put the mixing bowl above a pot with simmering hot water (bain marie). 3. Whisk the eggs with 220g sugar (added in three go’es) until light cream in colour, & thick in textureIt should be so thick that it dollops off the whisk. You’d be whisking for 5 to 10 minutes. The egg mixture would look like it tripled in quantity. 4. Put together 135ml sour cream + 20ml of lemon juice + lemon zest + 3g salt in a seperate bowl, then whisk it in to the egg foam. The lemon juice loosens the gloopy consistency of sour cream, & makes life a little easier to mix it on to the batter! 5. Sift & then fold in the 190g plain flour + 40g almond powder + 5g baking powder. 6. Warm the prepared 100g clarified butter to just above body temperature. Warm clarified butter is much more fluid than cold. It will merge with the cake batter better. 7. Take a little of the cake batter & mix it in to the butter dish. This technique will ensure that the butter mixes in evenly & quickly. 8. Now fold in the butter + batter mixture to the rest of the batter. Make sure it is thoroughly folded in to the batter from the bottom of your bowl, as butter is heavier than the batter, it sinks to the bottom & you’d have a weird hard layer on the bottom of your cake! 9. Pour the batter in to the prepared cake tin. 10. Pop it in the preheated 180 degree oven for 35 to 40 minutes, or until it passes the skewer test. Use a metal skewer & pierce the middle of the sponge. If it comes out clean & the tip is hot to the touch, then it is done. 12. When the cake has baked, quickly de-mold from the tin & place upside down on an oven tray. The bottom will be the top of the cake. This way, you’ll get a level top surface perfect for achieving flat icing. 13. Place the cake-tin wall back around the sponge. This trick will keep the hot lemon syrup from spilling everywhere. 14. Skewer the sponge & spoon the hot syrup over it & let it soak in to the hot sponge. – Peel the lemon skin. Make sure there’s no bitter white piths attached to the underside. – Cut it in to thin short strips. – Boil it in hot water for 3 minutes. Then drain. – Put it back in a pan with 50g sugar & just enough water to cover it. – Boil it for 6 minutes. – Leave to cool in the sugar liquid until you need it. – Place 200g icing sugar in a small bowl. – Pour in 35ml lemon juice & make the paste. 17. Place (upside down) cake on a level surface. Pour the white icing in the middle, all in one go. Let some (but not all) drip to the sides. 18. While the icing is still wet, garnish the top with the lemon strips &/ or chopped green pistachio. 19. For the extra glossy icing, put the cake back in a pre-heated oven (230 degrees) for under 1 minute. The moisture evaporates & the icing becomes slightly crystalized. This step also changes the mouth-feel of the icing from gooey to somewhat sharper. 20. Wait for the icing to harden. Never try to move the cake while the icing is soft as that will crack the icing surface. 21. Slice with a sharp knife. Wipe knife after every slice for the clean cut. 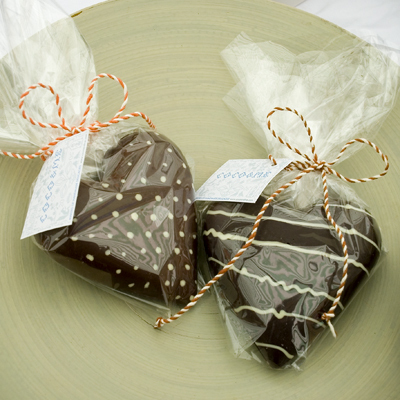 For this year’s Valentine’s Day I made just two chocolate hearts, & two-dozen of white heart discs with strawberry/ pistachios. I also made a lot more of my usual heart shaped tarts, especially more with the red raspberry fruit on top, which I knew would be a good seller today. And indeed, the day was fantastic, with lots of men going for the obvious red heart tarts & co. Some of them had beautiful flower bouquets too (lucky ladies). I always knew today would be great for my stuff, but what I didn’t expect was the overwhelmingly high level of business I was to have. 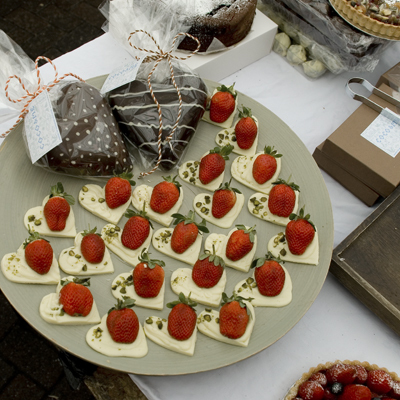 – I mean, the ‘fruit heart tarts’ sold out by 12 noon, & as for the strawberry heart discs, it disappeared by 1.30pm. At the end of the day, I pretty much sold all the truffles too!! Now that Valentine’s is over, the next big calendar event is Easter in April, when I get busy with making Easter eggs & bunny-shaped chocolate bars. But first, I’ve got a 3-tier Wedding Cake order for March! It’s for the son of my dear customer whom I like very much – I am so happy to be asked to make it!